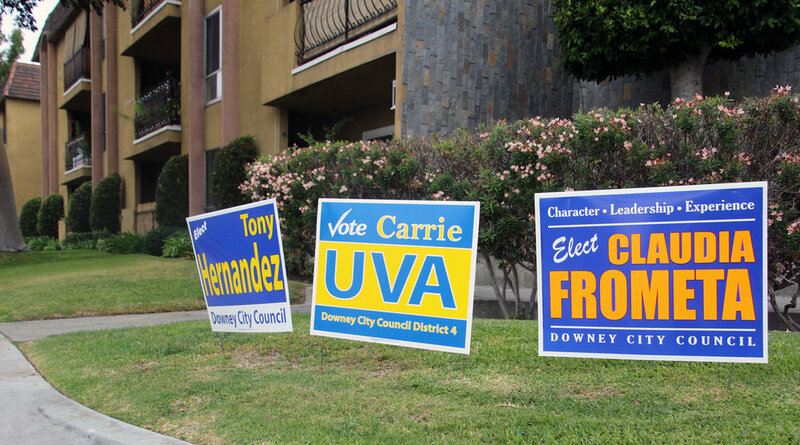 DOWNEY — Downey’s City Council is guaranteed to receive a fresh face this year when Councilman Fernando Vasquez vacates his seat due to term limits. Vasquez will be replaced by one of three people: Claudia Frometa, an emergency management consultant for Kaiser Permanente; Carrie Uva, a real estate broker and attorney; or Tony Hernandez, an insurance broker. Frometa and Uva both agreed to be interviewed. They were asked the same questions and asked to keep their answers to 250 words or less per question. Hernandez did not return answers to the interview questions. CF: I’m running for City Council because I care about this city. Downey has been my home since the late 1980’s. I attended Downey schools and have raised four children in this community. I’m passionate about families and this city. I want to be a strong advocate for all Downey residents and promote initiatives that support public safety, business growth/jobs and transparency. I want to maintain a strong and safe community for all our residents. What makes you qualified to be on the City Council? CF: My strong work ethic, transparency and advocacy for truth have defined my career over the last two decades. I have 20 years of experience in strategic planning, disaster preparedness/response and crisis communications. I am a leader with strong business acumen, problem solving skills and a keen ability to bring people together with a common goal. I have been a part of Downey since the late 1980’s. I attended West Middle School (now Stauffer) and Warren High School. I have raised four children in Downey, all of them have and are attending our public schools. Downey has a rich history that I’d like to preserve and protect for our younger generations. I don’t have ties to any other business/es that could pose a conflict of interest in my decisions as an elected city official. CF: I’m the only candidate being endorsed by the majority of Downey’s City Council, by the President, Vice-President and former President of our Downey Unified School District School Board. I’m also the only candidate being endorsed by BizFed PAC, a massive grassroots alliance of business networks in LA County, uniting more than 170 chambers, trade associations, minority business groups and economic development organizations. Their confidence in my leadership abilities speaks volumes. The endorsements of many community leaders and business owners like Champion Dodge and Downey Nissan speak loudly of my level of commitment, my integrity, my experience and business acumen. These respected leaders recognize my motives are pure as I don’t have other business interests to gain though this office. My professional experience as a former newspaper publisher with business management experience running a newspaper, and currently part of Kaiser Permanente’s National Emergency Management team. I have been involved with many organizations over the last 15 years as I raised my children while balancing my professional career; AYSO, DJAA, PTA, School Site Council and Downey Razorbacks football. I have been a Board Member for The Living Help Center, The Downey Foundation for Educational Opportunities and have been involved with the Assistance League /Gypsy Johnson Auxiliary. My involvement in so many different organizations has gifted me a unique perspective and understanding of this community and its residents, along with the many challenges families and students face. I’m also a native Spanish speaker. What would be your priority as a council member? CF: Work with our Council and Downey PD on initiatives to expand public safety and continue to be tough on crime. In 2016, voters approved Measure S, a half-cent sales tax increase to enhance public safety and quality of life issues in Downey. If it were up to you, how would those funds be prioritized? 1) Public Safety and the hiring of additional police officers and improving our DPD technology (which we are already doing by the way). 2) Focus on improving our city’s infrastructure: repaving of roads and high traffic areas/streets, (which we are also doing), review the current list of streets scheduled for repair and re-pavement and ensure we are communicating with our residents regarding those improvement projects. 3) Improving/refurbishing our cities’ parks, recreation and senior center (these projects are already starting to happen, more to come in the next 18 months). What do you envision for the future of the Downey Civic Theatre? CF: Downey is blessed to have its own symphony, a wonderful civic theater and arts enthusiasts and organizations that want to create a more vibrant cultural/arts community. I envision our Downey Civic Theatre as a booming venue, partnering with other theatres to bring additional talent to Downey. I would also like our Theatre to showcase the talent of our High School students, promote a high school student symphony made up of Downey and Warren students and advance the love and appreciation of art, music and theatre in this community with younger generations. The love and appreciation of the arts must be fostered at a young age. What is your opinion of the new housing developments being built throughout Downey? CF: The State of California is grappling with a tremendous housing shortage and homelessness issue. Because of it, cities up and down our state are mandated to provide affordable housing and narrow the housing gap; otherwise cities may face steep fines. The Council faces tough decisions on this issue. While the city must comply with the state mandates on providing affordable housing, council members must also consider the concerns of the residents regarding population density, traffic congestion and parking issues related to these developments. Working with our City Planner, we must look at where we see Downey in the next several years with growth and expansion and make common sense decisions that address the mandates along with the residents’ concerns. It’s a fine line that must be walked. Where do you see Downtown Downey in 10 years? CF: I would like to see a Downtown that brings our community together during the day not just night-time entertainment. Downey is a family-friendly community. Our median age is now 36. That means we are welcoming more growing families. Having said that, a downtown that offers options for our families and our seniors to gather and visit. While we have some good dining options, why not offer additional activities? We realize downtown real estate comes at a premium, but we must also recognize that robust and fruitful community engagement is the result of providing areas with open/artistic space for the residents to interact; these are often found in downtown places. What would you do to engage and support the cultural arts in Downey? CF: Make a concerted effort to bring art enthusiasts together and form greater partnerships and collaborations with the non-profit Downey Arts Coalition. We are always stronger together. There are some arts groups in our community that I would like to engage and visit with. As I stated earlier, a vibrant arts community makes for a stronger Downey. Work collaboratively with our arts groups and look at a strategic 3-5-year plan and think about having a Downey Arts/Film Festival. Downey just had the Glennfest Film Festival 2018 (a weeklong event from Sept. 30th-Oct. 8th that featured 9 movies and an art exhibit), why not make it a Downey Arts/Film Festival and partner with many others to highlight additional local/regional talent? Would you support a homeless shelter in Downey? CF: Cities up and down our state are grappling with the homeless population. We hear the concerns loud and clear from Downey residents regarding the homeless and while many are advocating the council do something about it, many say “not in my back yard.” There is no easy fix or a solution I can offer, except, we need to become more proactive and work together to come up with viable solutions to this growing problem. Would you consider outsourcing Downey’s fire protection services to L.A. County? Would you support a ballot proposition revising Downey’s term limits laws to give council members more time in office? Would you like to make a closing statement to voters? CF: Dear Downey residents/voters, Downey’s respected leaders, business owners and educators firmly believe I am the right candidate to represent District 4 for the next four years. They recognize my leadership skills, my experience, my dedication to this community, my drive to fight for you and most importantly, my desire to serve and represent you ethically and transparently. I look forward to having the opportunity to advocate for you and serve you over the next four years. I respectfully ask for your support and your vote on Tuesday, November 6th. CU: I am running for city council because I care about Downey and want to make sure the residents of Downey & business owners in Downey have a strong voice and advocate to represent their needs and concerns while making sure their safety is a top priority. CU: I have a Bachelor of Arts Degree, Juris Doctor Degree as well as an abundance of work experience dealing with individuals and families in both my Law Practice and Real Estate career. In addition, I have served as President of the Greater Downey Association of Realtors, served as a State Director for both California Association of Realtors and National Association of Realtors, and President-Elect of Downey Chamber of Commerce. I currently serve on the Downey Public Works Committee which has exposed me to many aspects of the internal workings of our city. Most importantly, I am a hardworking person that cares about my community, have the skills and knowledge to keep a balanced budget, spend tax payer money wisely while being open and transparent and attain the objectives of our city. CU: I’m a lifelong resident of Downey with over 25 years of service to our community. As the current President Elect for the Downey Chamber of Commerce, Public Works Commissioner, Past President of Downey Association of Realtors, and a member of numerous service organizations I know what it takes to get the job done. Leadership is about engaging our community and providing the insight to navigate the pitfalls of local government to ensure that the services that residents and businesses need are provided without wasting their tax dollars. Honesty, Transparency, and Dedication are philosophies that I live by. I’ll keep our local government accountable and serve our community with a strong voice. CU: Having walked my District for the past 6 weeks and talking to the residents, their concerns seem to be issues with parking, development of large condo/apartment complexes and increased traffic in the city. I would like to make these issues my priority once elected. CU: Police and Fire would be 1st priority as Public Safety is my #1 concern. The recent hiring of 10 police officers with measure S funds is definitely a step in the right direction. Next would be streets and sidewalks, youth & senior programs, parks and city buildings. CU: I would love to see the Civic Theatre bring back the plays, musicals and events that it used to have when I was growing up in Downey. It will take the passion of someone like Marsha Moode to bring back that level of enthusiasm for the Civic Theatre. CU: I fully understand the complexity of the new state mandated laws recently passed by our Governor wherein cities are required to build more affordable housing and more housing in general. Being that we do not have a lot of empty land in Downey, it is a more difficult task for us to comply. So we are faced with developers wanting to buy old houses on large lots, tear down the house and build condos/apartment on these lots. I feel the building requirements need to be re-evaluated. More parking spaces per unit need to be added. There is just not enough parking allocated per unit so that the owners of the condo are having to park on the street and nearby residential neighborhoods which is creating a parking nightmare in our neighborhoods. Every family has at least 3-4 cars and this needs to be taken into consideration when developers are submitting plans for new construction. CU: Our Downtown Downey has definitely seen a huge improvement in the last 5 years. However, the “nightlife” in that area is creating many problems with the business owners and residents in Downtown Downey. I believe these issues need to be cleaned up before we can even predict what it will be in the next 10 years. CU: I believe we need to engage our youth in Arts. Children and Teenagers seem to be more concerned with cell phones and video games and have lost sight of the Arts. We need to encourage Teens to take music lessons, learn to play an instrument, draw, paint, get involved in community theatre and have a more active role in the arts. Perhaps if the children got involved this would get the adults more involved in the arts as well. The Downey Arts Coalition is a great place for residents to explore things such as art shows, live music and theatre. CU: The homeless problem is a statewide problem. Growing up in Downey there were just a few homeless individuals in the city. However, the numbers have definitely risen in our city, just like in our surrounding cities. The homeless need financial and medical help. I would love to see these individuals in a more stable environment and if providing housing for them is the right solution, I would support it once I weighed the benefits vs. the burdens to our city and our residents. CU: I believe our Downey Fire Department needs to stay in Downey. Outsourcing it to LA County is not in the best interests of the Downey Residents. Outsourcing will create delayed response times and a negative impact on our community. CU: I truly care for the City of Downey. I have lived in Downey my entire life and have seen the city grow and develop over the past 53 years. I feel my 25 years of serving my community and working in Downey both as an Estate Planning Attorney and Real Estate Broker has given me the opportunity to assist many residents while at the same time earning their trust in me with their most valuable assets. I will carry over this trust to the Downey residents when elected and be the voice of their concerns and a problem solver for their issues while making sure Downey remains financially sound, and most importantly a safe place to live and work.